THE QUINTESSENTIAL COLORADO LOG HOME!! Enjoy the peace and tranquility of your own mountain retreat! Perfect location with easy access to work or entertainment in Denver and only 10 minutes to shopping, restaurants, and local entertainment in Conifer. This is a great property with spectacular views and a gently sloping usable 1.44 acre lot that feels like so much more as it backs up to a large Ranch. Love the outdoors? 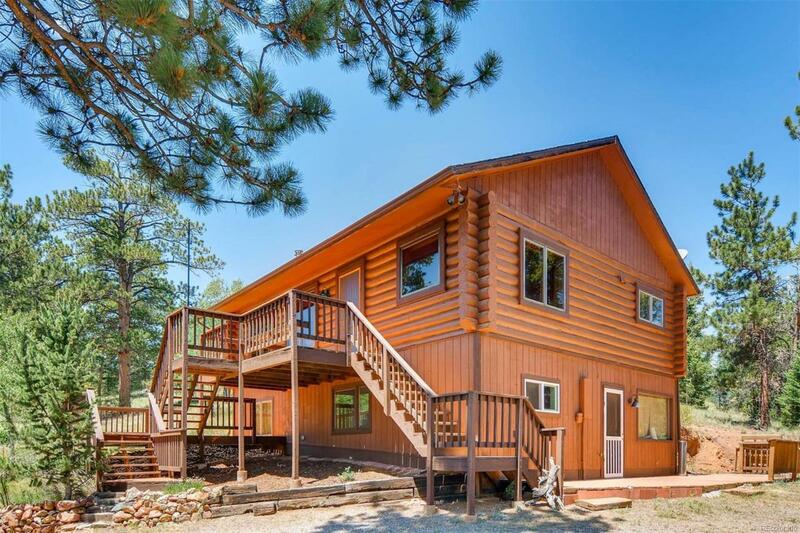 Great, this property offers easy access to Staunton State Park, Pine Valley Open Space, Pike National Forest, and Mt. Evan Wilderness. Also there is a community pond for fishing in the summer or ice skating in winter. This home boasts tons of rustic charm with slate tile, hardwood flooring, wood accents, antler chandeliers and much more. Move in and relax as almost all the maintenance has been done, new roof (with fire, wind and hail rated shingles), new exterior stain , new carpet in bedrooms, new hardwood floors, new range/stove/oven. Offered by Colorado Realty Pros.